In an alley, Raph is stumbling around, apparently suffering from memory loss. He last recalls being in New York with his brothers before suddenly being engulfed in a bright light. Next thing he knew, he was on another planet and his brothers were trying to kill him. He thinks the composition of the atmosphere of whatever planet they’re on is causing his brothers to go crazy. Needing to defend himself, Raph breaks into a nearby gun store and absconds with a laser pistol. He then decides to hunt down and kill the other Turtles before they can kill him. Raph spots Leo edging around a street corner, also bearing a laser gun. Raph gets the drop on him, shooting him through the chest. He then leaps up to a fire escape and waits patiently for Mikey to come sneaking by below. Raph shoots him dead, remarking that it’s a dishonorable way to die. Raph then scales to the roof of the building for a place to hide. Don climbs up the other side of the building and spots Raph’s bandana on the other side of a ledge. Thinking he’s got the drop on his brother, Don surprises him with his own laser gun, only to discover that Raph has tied his bandana around a chimney pipe. Before Don can realize he’s been set up, Raph moves in for the kill and shoots him. As Raph ponders his grim work, Leo, Mike and Don gather up to congratulate Raph for winning their game of laser tag. Raph, having imagined the whole scenario, comes to and says that he just really got into it. *According to Kevin Eastman's editorial at the beginning of TMNT (Vol. 1) #10, "The Survival Game" was intended as a preview for the upcoming Tales of the TMNT ongoing series, hence the "Tales of the TMNT" branding on the first page of this story. 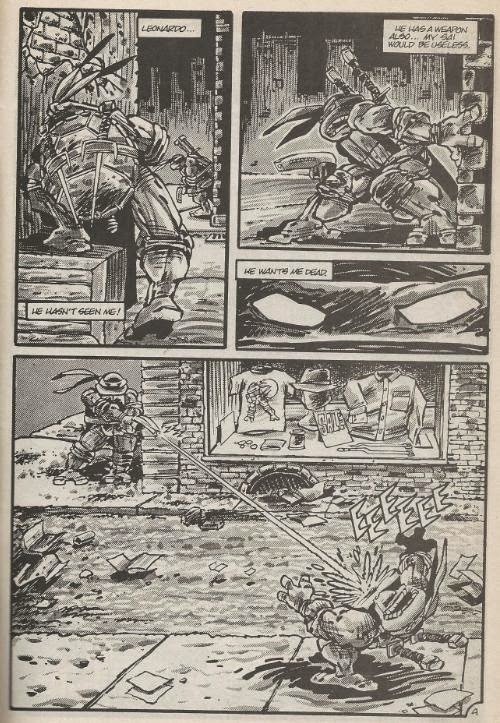 *A Ninja Turtles t-shirt can be seen for sale in the window outside the clothing shop on page 4. *A “Gizmo” comic can be seen on the ground on page 5. “Gizmo” was a comic produced by Mirage staffer Michael Dooney at the time. “The Survival Game” is one of those short back-ups I don’t feel particularly strongly about, so I probably won’t have a lot to say in regards to the thing. Not that it’s a bad story, it’s a fun little bonus piece, but there’s not much more to it. I do enjoy seeing the Turtles having fun and messing around like real kids their age, and NOT have the festivities interrupted by aliens, mutants or transdimensional warlords. Seriously, every time these guys try to relax, some sort of wacky nonsense happens. Like the universe is out to get them or something. So stories like “The Survival Game” and “The Road Trip” are entertaining in that they break the mould by being so mundane. But, you know, they’re still mundane. The credits don’t detail who did what, but I’m pretty sure that Ryan Brown handled the art for this one. It’s certainly not Lawson’s style, anyway. 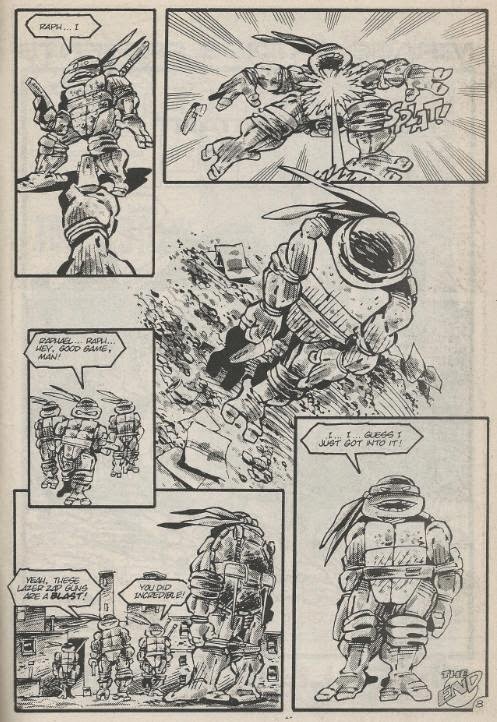 Brown draws the Turtles as squatter and rounder than most of the other Mirage guys, leaving me with the impression that this story takes place a few years before TMNT (Vol. 1) #1, as they look a bit younger. That’s just me, though. Brown did a lot of work on production and merchandise art for the late 80s TMNT corporate war machine, designing toys for Playmates and doing card art and all sorts of other stuff. So he tended to draw the Turtles with their trademark sneer… all the time. They cannot un-sneer. I suppose it’s a little annoying, but not a big deal. He crafts the action really well and the moody inks set a nice tone. As for the story, well, it kind of paints Raph to be a little more psychotic than usual. Guy really enjoys massacring his family. The one problem is that the “twist” at the end, that the conflict was all in Raph’s head, is undermined by the fact that the art remains entrenched in the “real world”. Raph is describing an alien world while clearly running around New York. So you figure out the gag ahead of time, which kind of kills the “twist” for you. 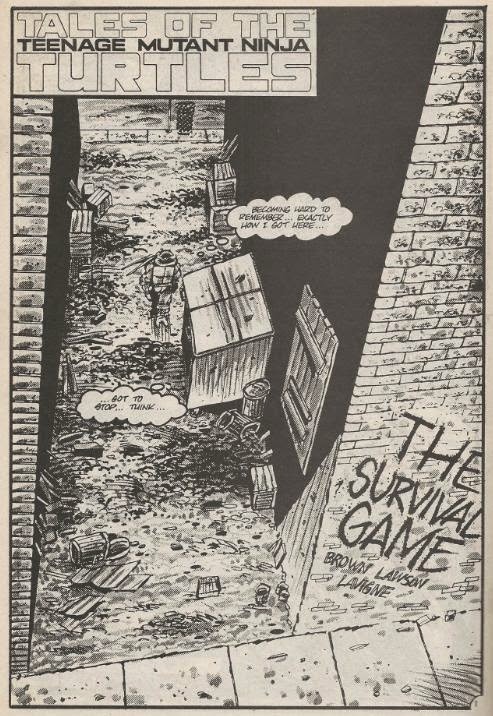 Overall, “The Survival Game” is an alright story, but not one of the more stand-out back-up strips in the book. Thanks for that! I updated the article with the info from Eastman's editorial. I wonder if Raph really crushed the window? I mean, it was just a game - so was this only his imagination?